Content writing is a trend, journalists and writers are happy about. However, it is not something every writer can opt for. It involves an extended set of skills to work as a content writer. Copywriter is a common job role found in advertising and marketing functions. Especially copywriters are indispensable resources in the advertising field because they initiate ideas and builds concepts for the ad campaigns to run. They write copy that suits a client’s branding, marketing and advertising needs. A good copywriter carves out his/her niche with their lucid writing skills, comprehension skills and creative ability. Content writers on the other hand, deal with a wider scope. Most people relate ‘content’ to ‘text’. They both are considered synonymous. However this is a glaring misconception people live with. The definition of content is not limited to text. Content means any resource used to communicate and convey an idea. In marketing, content is majorly used to run branding campaigns. In this context, CONTENT includes TEXT, IMAGES, STORIES, VIDEO, INFOGRAPHICS and a lot more upcoming categories. Therefore content writing includes design, programming, presentation, speech, scripting and directing apart from writing. Writing can be substituted with the other abilities depending on the content we plan to generate. This simply expands the scope of content writing. Hence, if you want to pursue a career in content marketing watch out for the other skill sets mentioned above. If you don’t have any them, start learning them before you are labelled as an out date. Do you move restlessly in your bed trying to solve biological problems with technology? Do you feel living systems can be made better by the use of technology? If your answer is YES to both the questions, then you should explore biotechnology. Biotechnology involves working with living systems and bringing in technology where ever improvement is possible those systems. A sequence of biotechnology, bioinformatics and bioengineering is used in the life of a bio-tech product. Biotechnology is used in healthcare, environmental studies, crop production, agriculture and food production. Basic lab skills, administration, inquisitiveness towards solution, problem solving, technical communication skills, decision making and creativity. Content marketing has climbed a steep peak in 2013. For those who want to pursue a career in content marketing, HCC has provided a map to understand this space better. How to read this map? 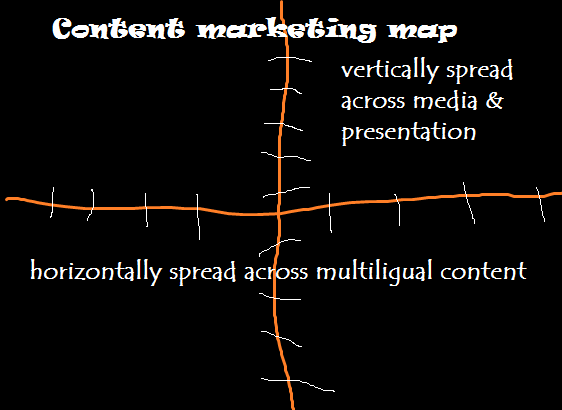 On the x-axis, horizontal spread, in other words potential of content marketing across the globe is represented. This signifies that content marketing is at its peak only in English. With the growing ubiquity of internet, content marketing specialists will have to prove their skills in other languages. We already see this with French, Russian, Chinese and Spanish. In countries like India where more than one language is spoken, multi-lingual content writers will be on the rise. On the y-axis, vertical spread across media and presentation represents the growth of content marketing and writing in different social media platforms. Eventually, social media specialists will emerge and a writing style specific to each media will be discovered. Apart from this the scope and definition of CONTENT will enhance and grow. In this context definition of CONTENT is “text, image, video, audio, slides and infographics”. From this year onward, a content writer has be an all-rounder. Some good things to be heard for education and skill development sector in India. Excerpts and observations from the Finance Minister‘s speech. 1000 crore for youth skill development, to increase employability. Nirbhaya bank, exclusive for women. NSDC announced that it is conducting a six month training capsule for educated youth. Learners will be coached in basic computing skills and an aptitude required for lower clerical skills in a bank. After long, arduous efforts for 3 or 4 years, you will be at crossroads wondering ,”what’s next?“. You are not alone at this juncture. Look carefully, you will find a lot of your peers here. You have this question occurring constantly here because of limited awareness about the career options you have. Ideally by knowing about these options even before you graduate is helpful.